Chocolate 5 is produced by adding fat and sugar to the cacao mixture. Milk chocolate is sweet chocolate that also contains milk powder or condensed milk. In the UK and Ireland, milk chocolate must contain a minimum of 20% total dry cocoa solids. In the rest of the European Union, the minimum is 25%. 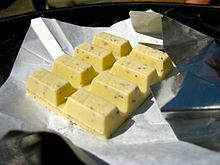 “White chocolate” contains cocoa butter, sugar, and milk, but no cocoa solids. Chocolate contains alkaloids such as theobromine and phenethylamine, which have physiological effects in humans. But the presence of theobromine renders it toxic to some animals, such as dogs and cats. Chocolate contains “brain cannabinoids” such as anandamide, N-oleoylethanolamine and N-linoleoylethanolamine.